Since 2008, I’ve included my team of seven horses, individually, into Constellation sessions, either privately or in groups. Our workspace, a large round pen, backs onto the bottom of a mountain ridge and faces eighteen hundred acres of pristine, chaparral landscape. The expansiveness and privacy of this location supports the sensitivity and intensity of the work performed. In a Horse Constellation, the set up is different. There are no tasks assigned for the client and horse to perform. Instead, the Constellation begins by simply sharing space. The individual and/or group, stand inside the round pen along with a horse at liberty (untied). When sharing space, there’s no pressure on the horse to do anything, which allows the horse to make his/her own decisions about where he/she wants to go to inside the round pen. A Constellation involves a specific person working on an intention for healing. Their intention determines how the Constellation proceeds. Group participants, referred to as ‘reps’ are given roles, and are positioned inside the round pen. The horse is invited to participate in the Constellation in an undefined role which organically reveals itself, or the horse may simply support the Constellation in whatever way the he/she shows up. The manner in which the horse participates in the Constellation offers pertinent information. An example; the horse picks a specific representative to stand beside and in doing so reveals a missing member of the family. Feedback from the client affirms there was a missing sibling in her family who died tragically. More times than not, the horse will actively participate in a Constellation. I’ve witnessed moments when the horse initiates a definitive action which nobody in the group can deny. An example of this was when Diva, a large black Percheron mare, gently nudged a client towards the rep of her wounded, inner child. Because the client resisted Diva’s suggestion, Diva made two more attempts at moving the client towards the arms of her child self. When the client said she felt coerced by the other representative into accepting this aspect of herself, I pointed out how Diva had supported this movement not just once but three times. What was Diva’s purpose in doing this? My belief is in order for horses to feel at ease, they have an innate sense of balance and will gravitate to physical, emotional and mental equilibrium. In this particular incident, Diva was expressing to the client how she needed to accept and integrate her ‘wounded inner child’ to experience wholeness. There are occasions when the horse seems to be completely uninterested in what’s going on in the Constellation, and behaves as if everyone is invisible. 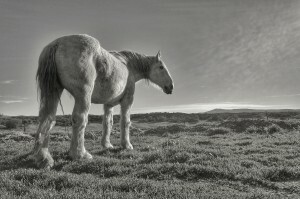 The horse might be gazing out into the horizon, nibbling at patches of grass or hanging out by the gate. In my experience, when the horse is not actively participating, there are walls around the Constellation. For instance, if the client is disconnected to their body and feelings, or if we have yet to make any significant discoveries in the Constellation. Frequently there is a breakthrough moment at the end of the Constellation when the horse who’s been standing at the gate will suddenly turn and go directly to the client. As prey animals, horses need to know their environment is safe. If there is an in-congruency in the energy field of the Constellation the horse will stay away. Consequently, if the energy field of the Constellation, however painful, is transparent, such as when a truth is revealed, the horse’s herding instinct kicks in and the horse will be join the group. I’ve learned to completely trust what happens in a Horse Constellation. I’m clear in the intention that the horses are here to support the Constellation for the highest good of the client, group, myself and all of our relations. If the horse doesn’t interact with the group during a Constellation it’s OK and correct. They are not dancing bears. If I am overly concerned with whether the horse will do something extraordinary, then clearly, as a facilitator, I’m not in a position to hold a neutral space. Yet in my opinion, when the horse appears to be doing nothing, they’re contributing to the Constellation in less obvious ways. Their presence creates a physiological effect in people. Studies have shown how a human’s heart rate will synchronize to the heart beat of the horse. Humans are incredibly attracted to horses, and feel good when looking at them and being in their presence. When we worked with children, I noticed how after a class, they remembered everything about the horse and not the flies which at the time they incessantly complained about. 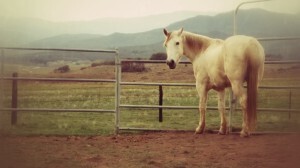 Many of our clients come to Silver Horse Retreat with an undefined longing to be around horses. 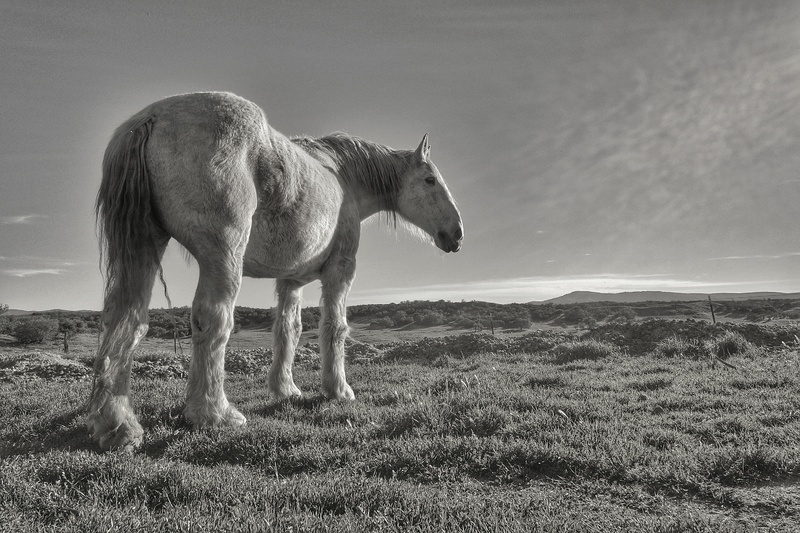 When someone is burdened with deep emotional trauma, it’s easier for them to connect to their wounding when a horse is present. Being outdoors, sharing space with a horse sets a benevolent emotional tone against a forgiving environment. The session becomes a symphony, inviting nature to participate. The wind picks up as a missing ancestor is identified and a plump of honking geese fly overhead as we’re about to explore a suicide in the family no one spoke about. This sacred dialogue with nature promotes a profound sense of connectedness to everything, reminding us we are not alone. 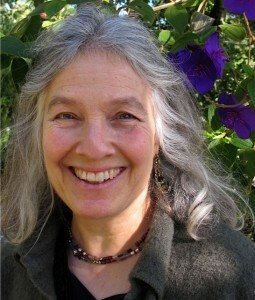 Sara Fancy has been practicing Systemic and Family Constellations since 2008 after graduating with Francesca Mason Boring. Her background is in Polarity therapy, Cranial Sacral Unwinding and Equine Therapy. Sara is the owner of Silver Horse Retreat in Warner Springs, CA. 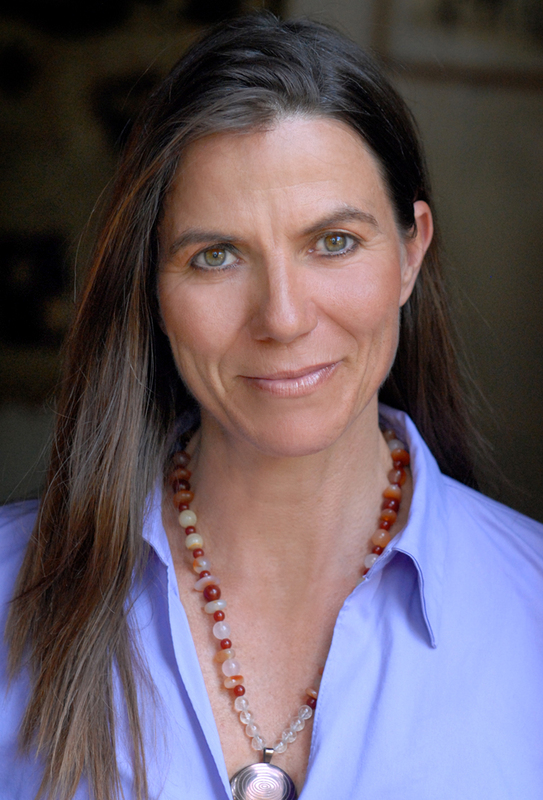 Sara was a presenter at the US Systemic Constellation Conference in 2013. We have set up two simple bulletin boards on the Venue Page to help you coordinate room or ride shares with other conferees. to go to the Venue Page. We are pleased to announce this special Post-Conference Event! Deborah Koff-Chapin, founder of Touch Drawing, and guest artist for the Conference, is offering a special 4-hour workshop in Touch Drawing. From a Constellations view, Touch Drawing can be seen as a visual representation of the Knowing Field. This is a terrific opportunity to work with a master teacher, using a modality that expands on the way of knowing that we use in Constellation work. You’re invited to join Deborah for this deep creative integration of your conference experience. All materials will be provided. The link below will take you to the Workshop Registration Form at the Center for Touch Drawing Website. September 15 is the deadline for regular registration. Register now to get the $445 rate. Registration increases to $495 after September 15. Visit our registration page to register now. September 19 is the last day to register for the reduced room rate of $127 per night. Visit our Venue Page to reserve your room. We are honored and excited to announce that Deborah Koff-Chapin, artist and founder of the Center for Touch Drawing, will be joining the conference! Deborah’s work is an immediate visual expression of the Field, created through a unique and beautiful process called Touch Drawing (see information and video below). Through the immediacy of Touch Drawing, I am able to visually portray the content and feeling-tone of a lecture, poetry reading, meeting or musical performance. I create 6-10 drawings per hour. I love the collaborative nature of the experience. I have done this for approximately 400 different presenters. Even without formally experiencing Constellation work, she immediately saw the connection between her art and the art of Constellations. In bringing her gifts to the conference, she introduces another tool for expressing the “Knowing Field.” We all look forward to what will emerge! Further, she will be offering a special touch drawing workshop in a Post-Conference Event on Monday, October 14 at the Westin Bellevue. Details are forthcoming – stay tuned at http://constellateus.com/latest-news/ for more information! We’d like to invite you to join us as a volunteer at the 2013 US Systemic Constellation Conference! This volunteer position as Room Monitor offers a registration discount, a conference t-shirt, and buffet lunch at the Thursday training. You will receive a $50 discount of your registration fee. You will be asked to serve as a Room Monitor in 3 sessions during the conference–these will be assigned from sessions for which you have already registered. You will be able to fully participate in the particular sessions you are staffing. Please contact Aysha Haq, Conference Room Staffing Volunteer Coordinator, if you are interested, and she’ll send you the details. Please email her at ayshahaq@mac.com with your full name, email, and phone number. She will follow up within a few days of receiving your email.